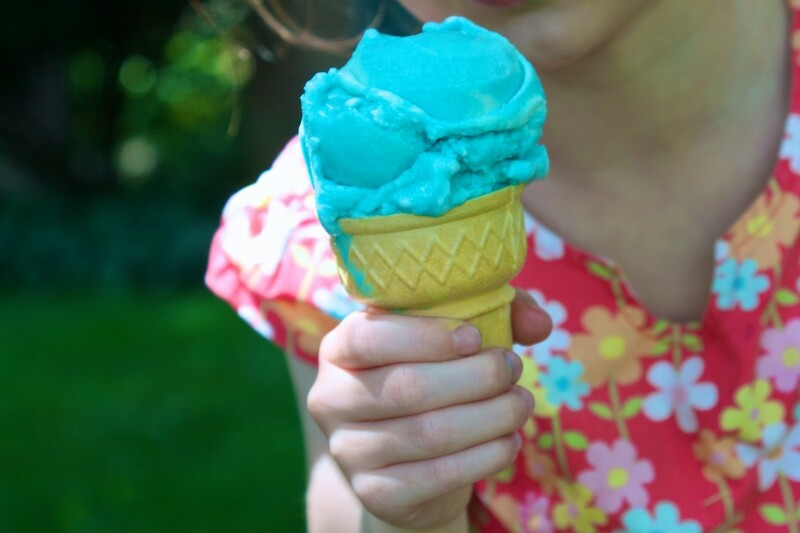 Blue Moon ice cream is a Midwest favorite among kids, and has a cult-like following among adults as well. 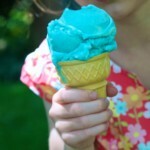 When I was growing up, the chance to actually pick Blue Moon for my cone came along just about as often as a Blue Moon. 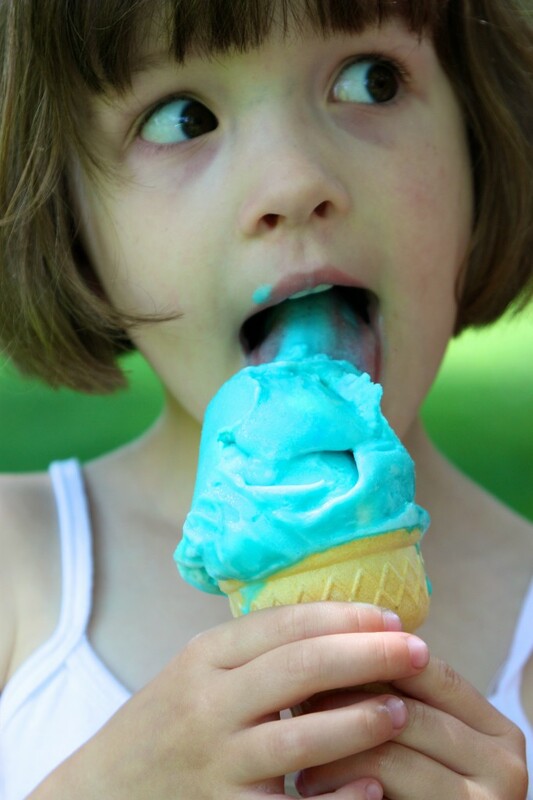 With four kids and lots of dribbly cones to manage, my parents limited us to flavors they actually wanted to lick. I’m probably the only kid to who truly believed that Butter Pecan, Chocolate Almond, Carmel Cashew and Butter Brickle were better than Superman, Bubble Gum, Black Cherry and Blue Moon. Given the very adult flavors of soy ice cream on the shelves, I started seeing the same parenting pattern evolve here as well. “Don’t worry kiddo, chocolate and vanilla really are the best flavors…so many possibilities for embellishment…” Well, today I took matters into my own hands, plucked up some tastebud courage and tasted…really tasted…the Blue Moon ice cream. The flavor is a bit hard to describe, but it is not fruity like I expected. It’s kinda bland, sweet, with a little almond, nutmeg and faint lemon…and very blue. I think my recreation is quite true to the real thing. I have a Cuisinart Ice Cream Maker which works great. It’s probably worth buying one. If you use it 5 times, you’ve spent as much on the equivalent amount in Tofutti pints…but the big blue grins alone would sell me anyway! Heat for 1 minute, until soft and puffy. Whisk the soft marshmallows until smooth, then slowly pour in the soy creamer and sugar. Microwave for another 3-5 minutes, stirring every so often, until the creamer is hot but not boiling. Stir in the nutmeg, vanilla, lemon oil and enough blue to do the job. Cool the mixture down in the freezer or refrigerator before pouring into an ice cream maker to freeze. I have a Cuisinart ice cream maker that works pretty well. Awesome! Do you think I can sub in real milk for this? I mean…you gotta like kid stuff when you're a pedi, right?! At our peds dept picnic we always have sno-cones! I got SO excited about it this year. I think I'd like an ice cream makes but will probably wait until later…not gonna have much ice cream making time soon! Oh that is wonderful! So glad it worked out for you, yay!! I just made a batch of ice cream myself today for my son. He loves it! Everything I read lately is about ice cream, so now it's settled. Cuisinart it is. Your blue moon looks absolutely mouth watering! i'm dying to try this (midwestern girl myself! i haven't bought an ice cream maker but am dying to get it now. what brand do you like? Cuisinart is a pretty good ice cream maker. The freezer bowl is nice and small, which is nice for storing in the freezer for spur of the moment ice cream making! We made this yesterday for our diary/egg/peanut-allergic four-year-old son and served it to extended family as dessert last night. Everyone raved! We’ve been making ice cream for several years and thought we had found the best recipes, but this one now tops the list. I was skeptical of the nutmeg, but it really was fantastic. Texture is the most difficult part to nail for ice creams that don’t use milk fats (in my experience! ), but this was perfectly creamy — I assume the marshmallows make the difference. Thanks for sharing! 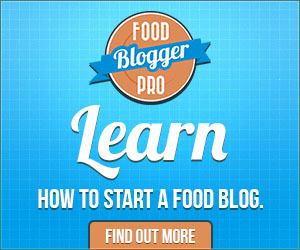 This is one recipe I’ve made and brought along to share with non-allergic kids & adults and it gets great reviews too. The marshmallows do two major things, they provide an “elastic” quality that allows the ice cream to be scooped and not crumble into flakes. It also masks the beany taste of soy. Some people don’t notice soy, I can taste it a mile away and I don’t like it! Marshmallows are magic! Can you use vegan marshmallows? Hi! I have tried this recipe twice (and bought the cuisinart attachment) but I just can’t seem to get it right, it swirls around and around in the machine but never solidifys. What could be causing this? Am I using too much oil? The taste is great! My son doesn’t mind just eating it as frozen from liquid but its just frustrating. Hi Ann! In general, I have a hard time getting my ice cream to freeze completely solid using any ice cream maker. I have to make sure the liquid is very very cold (sometimes putting it in the freezer for a few hours before I use the ice cream maker) and the freezer base of the Cuisinart has to be frozen solid (meaning, has been in your freezer for a minimum of 24 hours before using. I store my bases in my deep freezer all the time, so they’re always ready). Even then, the final consistency is like a soft-serve cone. I have to transfer the ice cream to a storage bowl & freeze it longer if I want a hard consistency. You could try removing the oil and see if that helps! Let me know how it goes!